My friends are now into running. Jay (my friend) was able to organize more members to join us in the runs. We have created our group and called it "Gone Running Club" (what do you think?). Our group's advocacy is Run Against Corruption. It all started in Condura Run (I guess, a lot started running again after that event), after that event, we joined other races and started inviting other friends to join us. Then after the mizuno run, Jay, Me, Noemi, and Allan were brainstorming on what name to use for our group and presented the list to the rest of the group. Everyone voted on their choices and ended up with "Gone Running". 21km - Paseo Sta Rosa - Nuvali - Ayala Westgrove - La Salle - Paseo Sta Rosa. Since i am not yet able to run due to my knee problem, i decided to support them instead by providing hydration at the Nuvali end point (for everyone), and at the guard house of our Village in SRV 2 (for those who ran the 21km). I was riding my bike and had my own route for my training as well. It was fun doing support since i get to motivate them to continue running. It feels good and am happy that everyone had a good run. At Nuvali.. Group starting to break out according to pace. Everybody.. if you are against corruption.. come join us..
Hey Mark, nice that you organized a group of running buddies, it's always fun to run with friends. Since we're all against corruption, maybe you could join us on our LSD's so that we would be an even bigger group :) Hope you knee gets better man, have you have it checked? Sure, let's do that.. 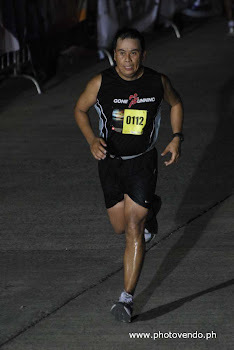 I believe Runnermhel is organizing an LSD in July here in Sta Rosa, we can run together. Let me know also your LSD schedule so that i can inform the group. Knees are fine.. Will refrain from running this week for faster recovery..